← Greatest Musicians – Do Polls Only Go So Far? Today when you go to a music store specializing in stringed instruments, you will see a variety mandolins by different instrument makers. They may come in different wood finishes and colors, yet the styles have remained the same for many decades. The two modern standards include the A Style and the F Style mandolins. These two styles can be credited to Orville Gibson, who as early as 1898, came up with different styles of mandolins from their predecessors. It is quite amazing, actually, that Mr. Gibson had the foresight to create styles for mandolins that are still in demand over 100 years later. Patent number 598,245, dated February 1898, diagrams the A style mandolin. Today, the A Style mandolin is quite popular and is the most affordable of the two styles. My original mandolin was an A style mandolin. It wasn’t a Gibson but it was a nice mandolin for a beginner to get started on. This mandolin sadly is hanging on my wall after accidentally falling from a shelf that at the time, I felt was a safe place for it to be stored. The lesson learned, a little too late, was to protect your instruments in a hard shell case whenever possible. Today, I play an F-5L Fern Gibson mandolin. It is a beautiful instrument with a wonderful tone. The early vintage F Style mandolins are highly collectible and quite valuable. You will often see many professional mandolin players performing with the F Style mandolins. Mandolin players have a common love of their instrument. If you are proud of playing your mandolin, I am certain that others would have an interest in hearing your comments and sharing their own stories of their favorite mandolin. Did you buy a mandolin recently? What style did you choose? Do you dream of one day having one of those vintage mandolins in your collection. Let us know! This entry was posted in History, Mandolin and tagged A Style Mandolin, F Style Mandolin, Mandolin, Orville Gibson. Bookmark the permalink. I’ve had my F-5G Gibson a little over a month. I chose the F style simply because of “looks”. Love the shape! I don’t really dream of owning a vintage one….I’m so tickled with this one that I’m perfectly satisfied however this may change with time….who knows. With regards to keeping it in a safe case, I find that I practice a lot more when the mandolin is within my reach. If I had to open the case each time, I don’t think I would practice as much. However, I did invest in a good Hercules stand for it….hope this doesn’t end up teaching me a lesson. My first mandolin was also an A-style. I found l just liked the look of an F-style. So right now I have an Eastman 515 and a Micheal Kelly Firefly. I am not too interested in a vintage mando as much as a custom made one. When my playing skills improve, I will order that custom made mandolin, and whoever sees it, will know it’s one of a kind! I also keep both my mandos on stands in my office for easy reachability! I appreciated this blog on mandolins. I recognized there were 2 different body shapes, but I didn’t know how they were classified. I’m with pinky, I like the detail that is put into the design. They really are works of art, and it is a shame to keep it in a case. Pinky, I’ve seen the price tag on that instrument, I would keep it in a case for sure! Something stupid always seems to happen to an instrument. I used to keep my guitar (my old one, not the Martin!) on a guitar stand in the living room, cuz it looked cool, until my cats were going crazy chasing each other around and knocked it over. Luckily, no damage. They stay in their cases now! I’ll find an old beater to put on display! But don’t let that F-5 become a beater! Thanks for the very informative article, I just read another blog that stated mandolins were at their height in popularity in 1908-09. Neat stuff. I am in search of my first F style Mandolin, thanks for this article. Interesting blog with lots of reading. I congratulate your efforts. I have just recently begun a blog on mandolins and the building and playing of them. I am based in Argyllshire in Scotland and my intention is to try to chat with other like-minded folk. My main interest is in the building of folk mandolins and octave mandolins, flat-topped, and I have built 13 in the past 4 years, with number 14 under construction at present. I have my first mandolin. It is a small A style from Big Muddy Mandolins in MO. I asked the builder about a pickguard and I am still undecided if I should have one or not. There are ways to attach one without it touching the body. It has been suggested I put some clear plastic on it. Has anyone done that? I think it might decrease the value of it. Mandolins are classic instruments that have been around for quite some time now because of its interesting sound. Usually utilized in bluegrass and folk songs, it is truly a great instrument in its own right. I would like to know what a “A” Style Gibson 1898 mandolin (Dark Rustic look) is worth. It is in great shape. It only gets played once or twice a year. Just a roundabout price would be nice. I am thinking about picking it up from my brother. We have had it in our family for some 38 years. I beleive his price is a little high. Thank you for your inquiry. Gibson vintage instruments can be very valuable to the right collector, especially if its in its original condition. However, monetary sense, its value will eventually be determined based on whatever a collector wants to pay for it. On the high end, Lloyd Loar mandolins are the most sought after mandolins and the prices fetched are astronomical. To determine the estimated value, you have to date the instrument and ascertain its condition. For instance A3 mandolins were initially made in 1902. Hopefully the instrument has all its original parts and has not been restored differently from its original condition. You can date the instrument by the serial number. The 1898 date you speak of is more likely the patent date and not the date the instrument was made. The older models were heavier than more modern mandolin and bulkier but had a nice warm tone. There were a couple different A models made by Gibson in the early 1900s. Standard models had more traditional looking heads while others had curved heads (wide near the neck and curved and narrow at the top). 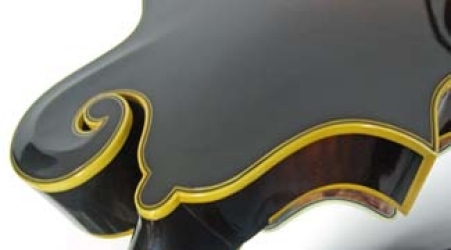 The curved head mandolins likely bring over one thousand dollars (depending on condition). So it is not a simple matter of giving you a rough value. Depending age, the model and on the condition , your instrument could be as low as $500 to highs that range in the thousands or even tens of thousands of dollars.